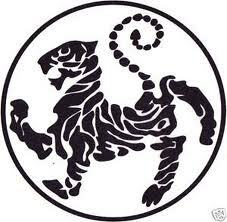 I find, when teaching kids, that the Karate Tiger Story is pretty useful. Here it is. “Al, I’m tired.” I looked at the youngster and knew that he wasn’t tired, he was just being childish. The problem was that he had chosen to be silly right in the middle of my karate class. When one of these future leaders’ of society interrupts my class in this fashion I always feel peculiarly irked. I get a desire to pick up that large stick with a nail in it that I keep in the corner of my school and…but I don’t. Instead, I tell them the story of the tiger, which has been told before, but which I will tell you now in my own inimitable fashion. “Just a little ways further,” said the older monk. The old monk walked a little faster. He certainly didn’t want to hear complaints from the younger generation. “No. I’m tired. I’m stopping,” and the younger monk sat on a boulder and began to fan himself. “We have to make it to the next temple. Get up now!” The older monk implored the younger man. “No. I’m just too tired to walk!” The younger monk kept fanning himself. The older monk, seeing a tiger sleeping in a nearby bamboo thicket, picked up a rock and threw it at the tiger. The tiger jumped up and chased the two monks. The monks ran like…well…like a tiger was after them. The older monk laughed. “I guess you weren’t too tired to walk after all.” The younger monk finally recognizing superior wisdom, began to laugh, too. There is a moral here. The monks were running for their lives. The tiger was only running for his dinner. Which brings us to my words of wisdom. Do you treat every day like it is a run for your life? Or do you pretend that life has bigger teeth than you? And the child in my kids martial arts class who complains about being tired? After I tell him the story about the Karate tiger…if he still complains about being tired I get out the stick. And it really does a have a nail in it! Score! A straight pointer to self-motivation and purpose. I heard this before, but i now have a new and different understanding. Because the point is not “just motivation” but purpose. And making THAT purpose the driving force inside. Not just the class, but the Belt. Not just the competition, but the Stand. Thank you.